My daughter’s Candyland board game inspired the idea for this party. All I needed was an opportunity to host one. Sure, it would have been a great birthday party theme, but I already had my two daughter’s upcoming birthday parties planned out, so with Valentine’s day approaching, I figured nothing says Valentines day than chocolate, candy, gingerbread man and heart shaped food. 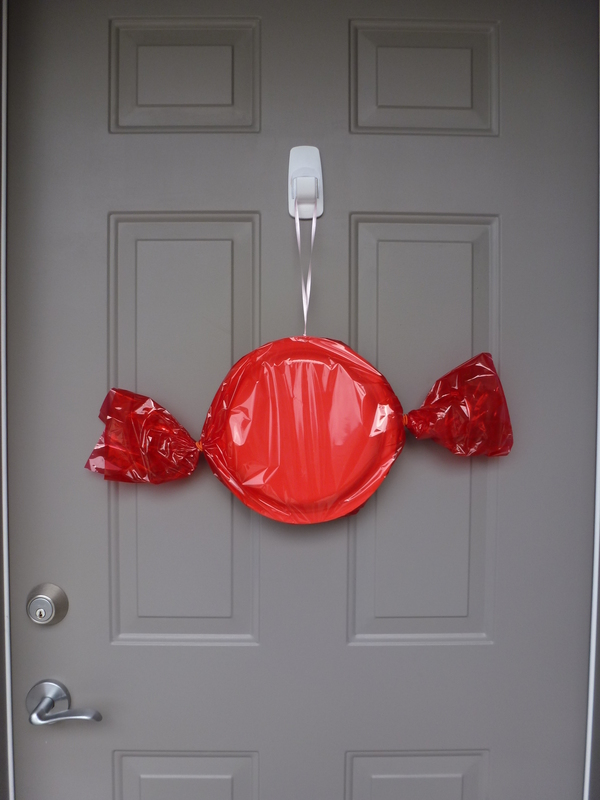 Very easy to do, this hard candy decoration replaced our usual wreath at the door. I used two paper plates which I stapled together, then used cellophane that I purchased at the dollar store to cover it over (leaving extra at either side to make it look like a hard candy) and tied the ends together with curling ribbon. 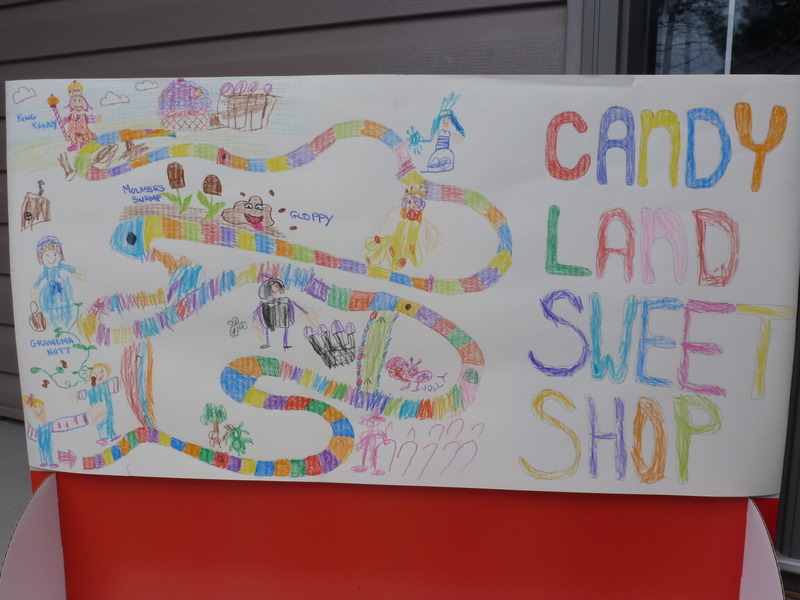 My five year old daughter helped make this replica of the Candyland game board as a welcome sign, welcoming our friends into the sweet shop. 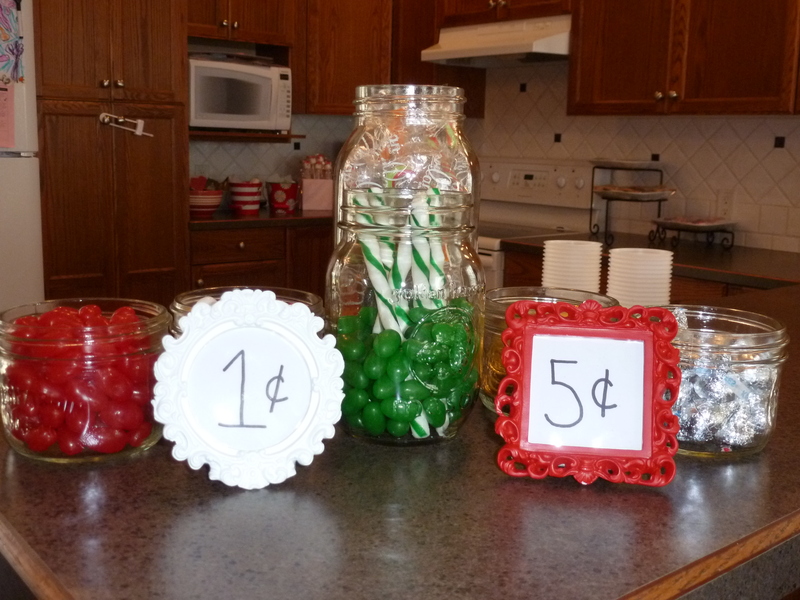 Remembering the days of penny candy, I filled up some jars with chocolate dollar coins, jelly beans, peppermint sticks, and other sweet treats. When we host play dates, we ask everyone bring a food item to share. 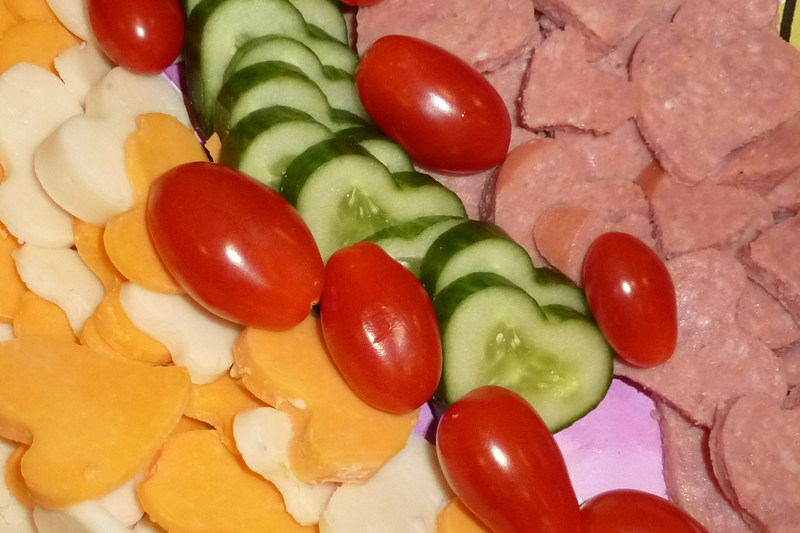 This was probably my favourite: a heart shaped meat & cheese tray, complete with heart shaped cucumbers. I had never seen cucumbers grown in heart shapes before ~ very cool! The kids were asked to bring Valentines to share with their friends. I provided brown paper bags, stickers and crayons for the kids to decorate. They were taped onto the eating bar making it easy to drop the Valentines into. My daughter and I made these the night before to give to our friends as a thank you for coming to our play date. 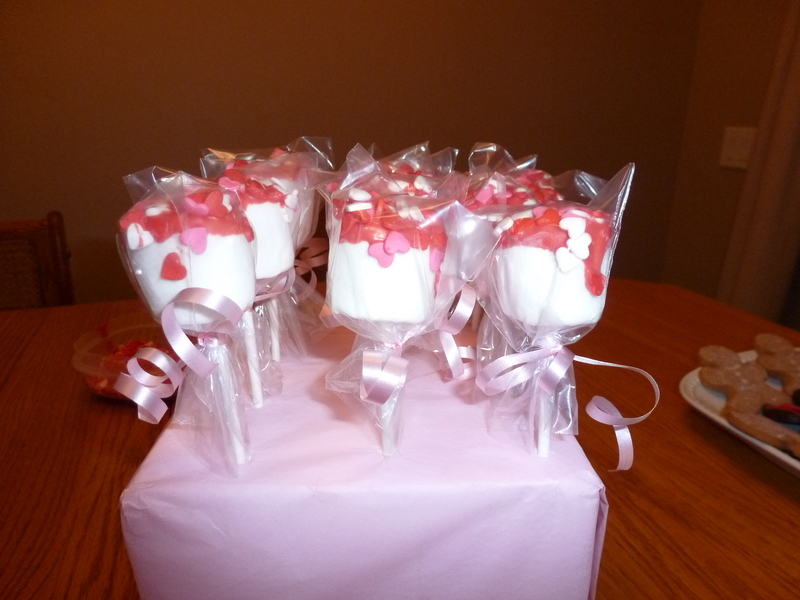 We took a regular sized marshmallow, stuck a Wilton lollipop stick in the bottom, dipped them in red candy melts and then added heart shaped sprinkles. Wrapped in little cellophane bags with curling ribbon and voila … an easy take home. We stuck them in tissue paper wrapped styrofoam block for a pretty presentation.